Robyn Vilate: awesome $250 giveaway!! Hello lovelies! I have teamed up with Style Lately and a group of awesome bloggers to help you expand that wardrobe of yours. One lucky reader will have the chance to enjoy a $250 visa gift card to get styled!! To enter, simply use the Rafflecopter below to complete all of the mandatory entries for your chance to win. The $250 Get Styled Giveaway will run until midnight on Wednesday, May 7th, and it is open to participants worldwide. The winner will be announced and contacted via email. So, now all you have to do is enter, go meet these fun bloggers and start thinking about how you'd spend $250...!! 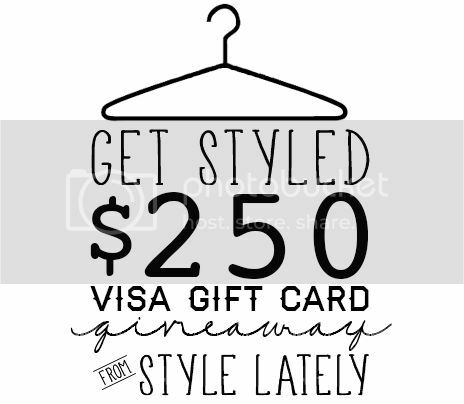 The Get Styled Giveaway is for one USD $250 Visa Gift Card. This giveaway is open internationally to people 18 years and older. The giveaway will run from Wednesday May 1st, 2013 12:01 AM to Wednesday May 7th, 2013 11:59 PM. ALL mandatory entries must be completed in order to win, including the winning entry. ALL entries WILL be verified, so please be honest in completing the entries. The winner will be announced on this Rafflecopter after the winner's entries are verified and the winner is contacted via email. To claim your prize, please respond to the email within 24 hours, failure to do so will result in a re-draw. Once the winner has been selected, the decision is final. This giveaway is not affiliated with Visa, Facebook, Bloglovin, Google, Twitter, Instagram, Pinterest, or any other social media platform. Bloggers in this group giveaway and their immediate family members in their household cannot win the giveaway. Love this giveaway! I will have to enter. Seriously need a new wardrobe!! I'm still wearing things from high school and i'm close to graduating college. :/ That's what being a newly married college student does to you!! It's not good!